The Porters meet two intelligent denizens of their new world. The Pakuni language spoken in this and other episodes of LOTL90 is made up partly of words from LOTL70 and partly original words created for this series. Bobby Porter, who plays Stink, was also the stunt coordinator for the series. He has acted and performed stunts in a wide range of movies and TV shows. 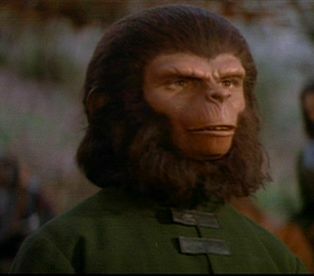 Besides Stink, you may have seen him as Lucifer on the original Battlestar Galactica and another ape creature, Cornelius in Battle for the Planet of the Apes. Stink and Cornelius...separated at birth? Tom is reading a paperback book at the beginning of the episode. He has the front cover and preceding pages folded back, so we can't read the title. At 1:31 and 1:40 in the episode, as Kevin is being chased up a tree by the makani (some kind of prehistoric wolves), it sure looks like one of them bites onto his untucked shirt! Christa the jungle girl is introduced in this episode. Christa is undeniably attractive. 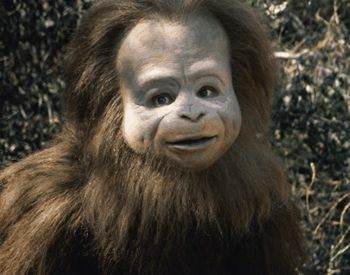 But just how is she able to keep her hair permed and body dipilatated in the Land of the Lost? At 12:29 in the episode, Stink is seen eating something from the branch of a pine or cedar tree. It can't be seen whether he's eating needles or berries or insects. It appears that not only has Christa learned to speak Pakuni, but Stink has learned to speak a fair amount of English from her. As Kevin drives the Jeep through the desert area with Christa, it almost appears to be driving over some dirt roads. Perhaps the roads are remnants of the defunct Sleestak civilization we will learn about in "Shung the Terrible"? The rocky desert area where Kevin and Christa gather an herb to treat Tom's osongi bite appears to be Vasquez Rocks, a Los Angeles county park which has been seen in numerous Hollywood productions since the silent film era. It is, perhaps, most recognized as the off-world setting of the "Arena" episode of Star Trek in which Captain Kirk fought the reptilian Gorn. The Gorn itself may have been an inspiration for the Sleestak. Watch the pterodactyl in this episode (and throughout LOTL90); they are really able to turn on a dime in mid-flight! As Annie and Stink wait for Kevin and Christa to return with the medicine, night falls and we see that they have a campfire going to keep away the makani. Were there matches or a lighter in the Porters' pack? Or did Stink make the fire for them with flint or sticks? While under the fever of the osongi bite, at one point Tom deliriously sits up and says, "Annie. Kevin. Get in the car. We're going camping. We're going to the cabin." Is this a reference to the vacation the Porters were on when they got trapped in the Land? It seems to imply that Tom owns a cabin somewhere in a backwoods environment. At 19:53 in the episode, it seems that Tasha swats away a makani with her tail. But the blurry image of the swat shows a tail that is much longer than Tasha's. Her actual stubby tail is not of much use for swatting at all. At the end of the episode, Tom indicates that he and his family are from San Francisco. 11:13 Christa and Stink say "osongi." An osongi is a type of poisonous lizard found in the Land; it looks similar to an iguana. 11:33 Christa says, "Miyog. Miyog." "Miyog" means "far" or "too far". 13:34 Christa says, "Nass! Nass!" "Stop! Stop!" Christa says, "Misan." This word is unknown, but Christa is pointing at a pterodactyl nest containing eggs as she says it. 17:05 Stink says "makani." Makani are a type of prehistoric wolf found in the Land. 17:55 Christa says, "Coomazumazee." "Pterodactyl." Christa says, "Ayo." "Yes." The word "ayo" is similar to the word "yoo" which means "yes" in LOTL70. Perhaps there are similar but different dialects of the Pakuni language. 19:26 Stink says "makani." Makani are a type of prehistoric wolf found in the Land. Christa is able to make a howling sound that scares off creatures of the Land. Is the sound a mimic of something else in the Land we have not seen?